Three Coins in the Fountain is a simple film, with no heavy themes, or pretense. And so devoted is it to simplicity that the song playing over the opening credits – scenes of life in Rome, around Trevi Fountain – spells out the entire conceit of the film: if you make a wish and throw a coin in Trevi Fountain, you’ll have that wish granted, especially if it’s a wish for love. Sure, the wishes that two of the three leading women in the film make are not so much about finding love as returning to Rome, but that hardly matters because the fountain gives all three women love anyway. One, finds it in a forbidden office-romance with an Italian law student. Another finds it with a roguish Italian Prince. The other finds it with an aging ex-pat writer she’s been secretary to for 15 years. I know you only have one week remaining to get your pre-order in for The Best Picture Project book, but that doesn’t mean you actually have to wait until the last minute — get it now! The Best Picture Project — Pre-Sale Now! Hello, cherished readers. As followers of this blog, you are no doubt aware of the long-running The Best Picture Project, a semi-regular series exploring every Best Picture winner at the Academy Awards from the beginning, through today. Well, if you were wondering if there was a way you could have The Best Picture Project in book form — well, you can! Set for release on November 17, 2017, will be The Best Picture Project. Featuring complete re-edited content, and together for the first time ever in one place, you can pre-order the book now for the Kindle, for the low-low price of $3.99. What a steal! And if you’re a member of Amazon Prime or Unlimited, you won’t even have to pay that! And wait — if you’re one who prefers their media to take physical form, there will be a paperback version available as well. Unfortunately, that version cannot be pre-ordered, for reasons completely unknown to me. But never fear, come November 17, 2016, you will be able to order your own copy. Confession is an appropriate place to start this entry, given the heavily Catholic tone of The Exorcist, so here goes: I’ve seen The Exorcist before. See, when I started this Project – The Also Ran’s – I had the idea I’d use it to see Best Picture nominees I’d not seen before as a way to force new viewing experiences on myself. Given I’d already seen many of the Best Pictures, that made the Best Picture Project as much about revisiting films as it was about discovery. By definition then, The Also Rans was explicitly meant to be about discovery because it excluded movies I’d already seen. Moreover, it would also give me a unique look at the workings of prior generations, in that by looking at what lost, I might find something very instructive. 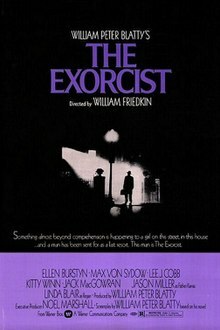 But while this is my aim, here I am throwing the rule away and using this project as an excuse to re-visit The Exorcist. Why? Because it’s my Project, so it’s my rules to break. Also, because with The Exorcist, any viewing will be a discovery.